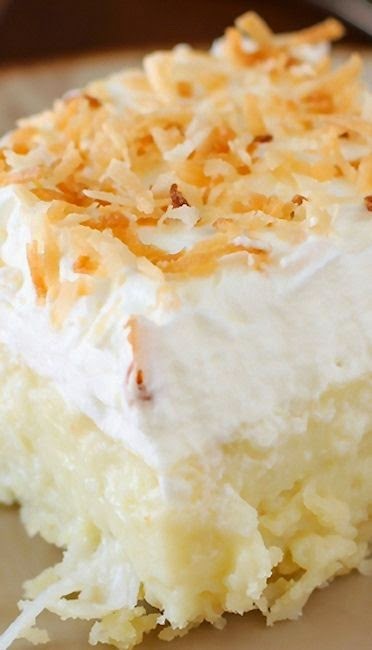 Coconut Cream Pie Bars | FoodGaZm..
Could Easter really have been a week ago? Time is flying like the wind! We had a wonderful long visit from my mother, and my brother. It was a whirlwind weekend but such fun to have little ones in the house. Just yesterday we finished off all of the leftovers ( and I sent some home with them! ). My husband announced last night that the 2 refrigerators are officially empty! I think that was a signal for baking to commence. I'm not a huge coconut fan, but he certainly loves it ( along with anything else containing sugar). And since I am going to the gym 4 days a week, I am perfectly happy to have sweets in the house that do not tempt me. This recipe makes a 9x13-inch pan of coconut pie bars. There are several advantages... Portion control, more servings than a traditional pie and no pie crust to make! Winner! Winner!